The Stewart/Hartin house, built in the spirit of Neo-Gothic architecture, is unique in Richmond Village not only for its design, but also due to the fact that only two families, both headed by patriarchs with an eye for beauty and detail, have owned it. The first owner, James Stewart, built this house after his original family home was destroyed by fire. The second owner, Dr. Kenneth Hartin, has preserved and restored the building’s finest features. James Stewart was not the original owner of the property. Records indicate that previous owners of the land (legally known as parts of Perth Park Lots 8 & 9) included Michael Donaghoe, F. Le Charité, John Bower Lewis, and James Copeland (1844-1879). It’s not clear whether there were any buildings on the land before Mr. Stewart purchased it in 1879. The Walling Map of 1863 shows that Mr. Copeland owned a hotel on Lot 7. However, there is no indication of buildings on Lot 8. James Stewart (1849-1923) was born in Richmond. In his youth, he was a notable local athlete with figure skating and lacrosse being his sports of choice. A trained and licensed undertaker, Mr. Stewart originally built a wooden frame house on the site, making it his home and centre for his commercial activities. His business stretched outside the village as he attended to funerals from St. Claire’s, Dwyer Hill in the west to St. Patrick’s, Fallowfield in the east as well as the churches in between. He was a respected member of the community holding various positions: village councillor, multi-term Richmond Reeve (from as early as 1903), elder and trustee of St. Andrew’s Presbyterian Church, and member of Goodwood Masonic Lodge. The area surrounding the house was used to support his family and undertaking business. Stewart and his farmhands grew crops, including hay to feed his prize-winning teams of horses which were used to transport his hearse and carriages. The horses were a source of family pride as seen by the fact his son, Sefton, a soldier in the trenches of France during World War I, wrote home in the fall of 1917 asking how well their horses had done in competition at the Richmond Fair. Dr. Kenneth Hartin, the second owner, believes that, artifacts he has uncovered on the property, indicate that there was once a blacksmith and/or wheelwright shop close to Perth St. Not only wheels but also carriages would have been made and repaired by Mr. Stewart as seen by the entry in Morrey’s “Directory of Cities, Towns & Villages” for 1899 that listed James Stewart of Richmond as being a “carriage maker”. The Stewart family was not without tragedy. James’s first wife, Rachel Alexander of Stittsville, and mother of his two oldest children, Garnet and Eva, died from consumption. In January 1895, he married Margaret (Maggie) Clark McLean, an English-born woman who was 21 years younger than he. She had arrived in Canada at age 16 and accompanied her parents to Richmond in 1891 when her father, Rev. Hugh McLean, accepted the call to be minister at St. Andrew’s Presbyterian Church. James and Margaret Stewart had seven children between 1895 and 1909. The eldest Clystal born in November 1895 was soon followed by George (1897-1956), Sefton (1899-1918), Evyleen (1905-2004), Ivy (1907-1962), Norma (1909-1996) and a daughter born in 1903 who died as an infant. A second tragedy occurred some time around 1897 when fire consumed the wooden-frame family home leaving behind as mementos some pieces of furniture and scorched trees. Another tragedy was the death of the Stewart’s youngest son, Sefton, during the battle of Amiens in World War I. The present stone house replaced the burned wooden structure. Local reports state that Mr. Stewart designed and supervised the construction of the new building. Seven years passed before it was completed to his satisfaction (around 1904). It is said that he built other houses along Perth Street including this small frame workman’s cottage on the east side of the stone building. The property also, at one time, had many outbuildings to support Mr. Stewart’s businesses. 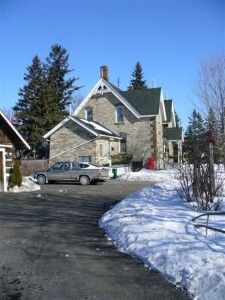 The log garage which is presently to the left of the house is not one, as it was moved to the site by Dr. Hartin to replace a garage (shed) which had housed Mr. Stewart’s carriages and hearse. James Stewart died on December 23, 1923. His widow, Maggie, continued to live in the house for another 30 years. 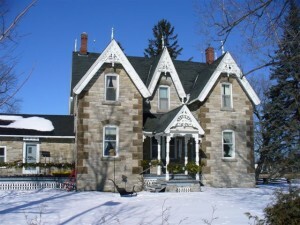 As the Stewart daughters moved from teenage life to adulthood, the stone house continued to be the centre for family life, weddings and christenings. Maggie remained involved with local church and community organizations. George Stewart, son of James and Maggie, and also an undertaker like his father, lived in the house with his family from 1953 to 1955 while his mother lived with her daughters until her death in 1967 at the age of 97. 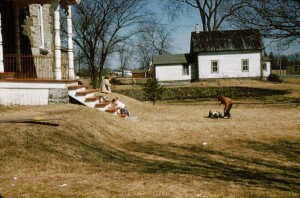 Children at play around 1960. Note the stairs which now come off the west side of the porch. The house to the east (on the right) was once close to the road. Dr. Ken Hartin and his wife, Kay, purchased the property in 1956 and the stone house once again heard the happy sounds of a young family. Dr. Hartin carried out a large and small-animal veterinarian practice serving Richmond villagers and the surrounding farms. He used the previous summer kitchen in the west wing of the house as his office and hospital. After 27 years in private practice, Dr. Hartin moved to Agriculture Canada where he spent the next 14 years working to improve animal husbandry in Canada and abroad. An elder of St. Andrew’s Presbyterian Church, founding member and constant supporter of the Richmond Lions Club, and a former village councillor, Dr. Hartin is a well-respected and popular member of the community. The house was sold in 2012. It is said that James Stewart designed this Neo-Gothic style house. Its general shape – twin projections covered by steep gabled roofs and connected by a low entrance – is similar to designs found in pattern books authored by A. J. Downing and is common in the United States and Southern Ontario. Mr. Stewart probably saw houses of this general design when he visited the Chicago World’s Fair in 1893. This house differs in several major ways from the buildings found in Downing’s books. Rather than a single entrance opening from the front porch into a central hall, the main door opens to the right into a foyer from which stairs rise along the eastern wall. A doorway opens left from the foyer into a large central oval-shaped room that stretches across the front of the house. To-day a wide arch (Dr. Hartin replaced pocket French doors) connects this parlor to the dining room which runs across the back of the house. Mr. Stewart had found an ideal plan for a large family which liked to entertain relatives and friends. The plan also facilitated the use of the home to hold wakes although James’s daughter, Evyleen, recalled to her daughter, Janet Reid, that their home was seldom used for that purpose as, in Stewart’s time, most deceased persons were waked in their own private homes. Maggie Stewart had an influence in the design of her new home. After having her wooden home destroyed by fire, she insisted that the new building be constructed of stone and have no fireplaces. James used limestone as the main exterior material with local sandstone (from Black’s Corners) used for the quoins (decorative corner blocks). 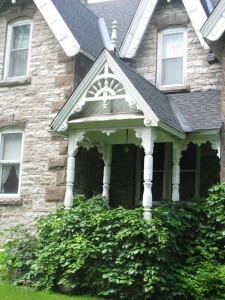 The fine detailing and intricate trim were similar to those of other elegant houses of the time. Stone was used to highlight the tops of the rounded windows and sills, but the major decorative features were wood. 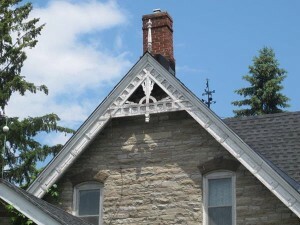 Elaborately carved pediments still cover the gable ends and the entrance to the recessed porch. Each is finished by a turned dropped finial. Over the years Dr. Hartin has managed to maintain the porch’s original turned posts. This side view shows the addition as well as the corner of the log garage Dr. Hartin moved to the site. 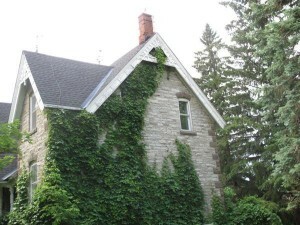 The stone addition on the west side of the house, used as an office by Dr. Hartin, was built of the same stone, but lacks the fine detailing. Dr. Donald Mills, a grandson of James Stewart, provided this description of the addition as it looked in an earlier era. “The stone addition to the house on the west side I remember well. One went up the stairs on the right to a ‘summer kitchen’ with a kerosene stove with three burners, used only in the summer months. On the left side at ground level was an area where fuel was stored for the furnace – stacked wood as I recall.” Dr. Hartin says there were no stairs to the present north and south doors of the addition when he moved to the house. Dr. Mills remembered that the house had a cistern with a manual pump in the kitchen proper to bring soft water upstairs to the bathroom. Dr. Hartin noted that the kitchen itself was unusual in that it had a hardwood ceiling (with the same design as the ceiling in St. Paul’s United Church) but the floor was of a softwood – pine. He also noted similarities between the interior woodwork (especially the stairway) and the interior woodwork of the Chanonhouse House. Both the church and Chanonhouse house were built within a decade of the Stewart/Hartin House. Evyleen, James Stewart’s daughter also mentioned to her daughter that the stone house had indoor plumbing installed before her father’s death (1923). This is earlier than many if not most village houses. Indeed, the Stewart/Hartin House has added many unique features to the village landscape. Blair, Gladys “An Outstanding Gothic” copy of newspaper article from unknown source in files of Goulbourn Museum. No date. Graham, Mildred et al. Richmond “150” Yesterday and Today 1818-1968. Ottawa: 1968. Hartin, Dr. Kenneth. Personal Interview. May 26, 2009. Kalman, Harold. A History of Canadian Architecture. Vol.2 Toronto: Oxford University Press, 1994. McCoy, Cheryl. “Interview with Dr. Kenneth Hartin, July 2007” Four Part Series. Goulbourn Township Historical Society Newsletters. 2010. Reid, Janet. (Granddaughter of James Stewart) A written description of life in the house as told to her by her mother Evyleen (1905-2004), aunts, and cousin. July 2013. This entry was posted in Locations and tagged Industry, social activities, village government. Bookmark the permalink.